IN2FAB developed the Port on Demand program to deliver a proven and effective migration service to companies who require rapid migration of analog and mixed signal IP. The program has delivered hundreds of circuits in a wide variety of processes and foundries. The port on demand facility combines IN2FAB's OSIRIS migration technology with years of engineering experience to deliver ported IP to a fixed schedule and cost. The Port on Demand service is available directly from IN2FAB and also from our partner, Wipro Inc. Wipro has chosen the OSIRIS toolset to deliver migration services to its customers around the world as part of its portfolio of design engineering services. Port on demand projects follow a three phase process that allows flexible and efficient processing and reliable delivery of ported silicon. 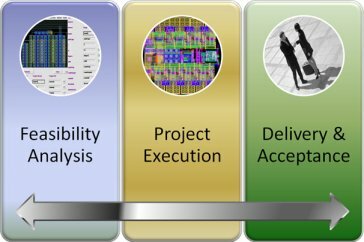 The feasibility process study produces a detailed description of the three factors of the migration process: design data, source and target technology. The models and parameters for each source component are highlighted against its substitute in the target process. Details of design and other parameters are presented and the analysis provides the basis for cost and schedule for the entire project. The circuit is migrated by skilled project engineers using IN2FAB's OSIRIS technology. Sections of the design are completed to a pre-agreed schedule to allow post-layout simulation to be undertaken on the circuit's critical areas. The final database is delivered after DRC and LVS verification to the decks supplied by the target foundry. The customer completes incoming inspection and installs the migrated circuit in to its own environment.